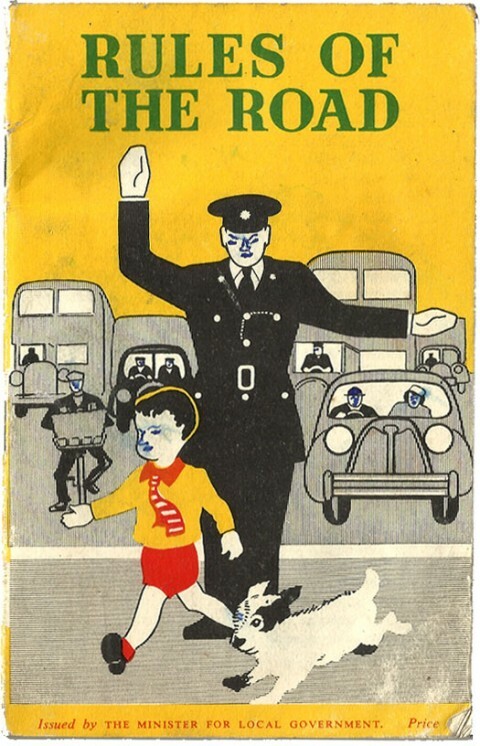 Issued in 1957 by Ireland’s Minister for Local Government, this appears to be our first Rules of the Road booklet. It is a neatly designed, pocket sized, 32 page book which cost 2d. Some of its charming illustrations were used again in the 1967 version, which we featured in an earlier post. I’ve scanned in the cover (with added biro) and some pages below including the Stopping Distances diagram, which surely was a contender for the Irish “Infographic of the Year” award in 1957. How much would the 1957 files of the road be worth.